Alchemist and apothecary are interchangeable terms and refer to someone making chemistry goods for a living. 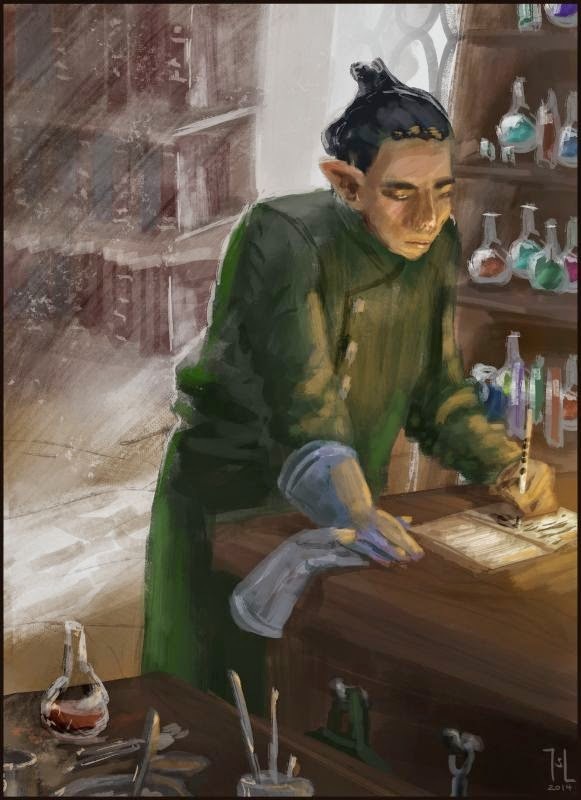 The science demands a lot of precision and tables, which all satisfies the likings of mages, who are the majority of apothecaries; unlike other sciences, where speakers are only a fraction of all practitioners. Apothecaries create medicaments, soaps, dyes and inks, acids, and perfumes, and their knowledge is useful for an array of other professions, like mining, botany, tannery, or medicine. "I am looking for a new medicine against greyskin disease. It proves to be very tricky; so far I have found several antidotes, a complex fertilizer, and ingredients that make black earth grow a quarter faster, but nothing I aimed for." Many apothecaries are surrounded by a nimbus of danger and crime. Indeed, some of the substances they use are either dangerous themselves or can only be procured under doubtful circumstances. In any case, all apothecaries love the imports of Gdera's colourful forests and Lozirian minerals, and can make good money with their rare and dangerous profession. "At first we thought the homebody apothecary would be dead by afternoon. But she was quick with analyzing and antidotes and had saved three of us by evening. We are grateful she accepted to join the tribe, and have suffered much fewer losses since then; although she still complains we hadn't any decent biscuits." Alchemy is one of my favourite fantasy subjects. I must have spent dozens of hours in every part of The Elder Scrolls making potions. I think it's neat to cook up strange elixirs from weird ingredients, and it's fun to come up with alchemical uses for things. I don't think I will make alchemy a big point in Genius Loci, but it's nice to have a job like this for added interest.